The Curtiss SB2C Helldiver was the US Navy's principal dive bomber during the latter part of WWII. First entering combat at Rabaul in November 1943, by the middle of 1944 it had completely replaced its predecessor,the Douglas SBD Dauntless, aboard the fast carriers. Following the Marianas operation in June and July 1944 SB2C squadrons participated in the advance through the western Pacific, via the Palaus and Philippines, to Okinawa and the Japanese home islands. 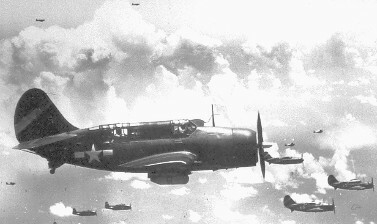 Post-WWII, Helldivers continued to serve in USN carrier bombing/attack squadrons until early 1949. Foreign use of the aircraft included employment by the Greek Air Force in that country's civil war of 1949, and carrier operations over Indochina by the French Navy from 1951 to 1954. In the early fifties it also saw service with France, Italy and Portugal for anti-submarine warfare. If any relatives of former Helldiver pilots or crewmen are trying to discover more about their operational service I shall be pleased to try and assist. Contact e-mail is at the bottom of the page. 1) Some sad news is the death in March of R.Adm. Martin D. Carmody. "Big Red", as he was known, was X.O. of VB14 during its combat cruise on Wasp in 1944; he later commanded VB98, the West Coast replacement training squadron. Carmody was one of the Navy's top strike leaders of WWII. An obituary notice includes a message to his former VB8 squadron mates: "He wanted then to know that they have his deepest respect and admiration and he will be there to welcome them to that carrier in the sky". An interesting story has appeared recently in the San Diego Union-Tribune concerning a VB14 SB2C-4 that ditched in Otay Reservoir in May 1945. Attempts may be made to recover the wreckage and restore it for the Pensacola Museum, where the absence of a Helldiver airframe leaves a serious gap. Another Helldiver wreck has now been located just offshore from the old NAS Puunene, Maui. Thanks to Sean Dyer here is a link to some photos of the remains. When asked to identify the particular aircraft involved I suggested SB2C-1C, 18400, of VB4 which ditched in the area on 31 August 1944. The pilot was Lt. W.E. Dill. Subsequent dives have now confirmed the Bureau Number as 18400. On 10 August 1943 VB17 returned to Norfolk aboard Bunker Hill at the end of the carrier's shakedown cruise. Over the next two weeks the squadron received 36 newly modified Helldivers that it would initiate into combat later in the year.